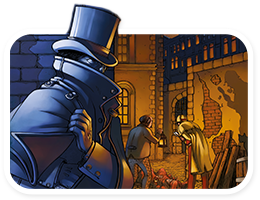 Mostly Board Games: Jack You Ripper! I love two player games and the strategy behind them. Its you vs the other player, and often 2 player board games revolve around you outwitting your opponent with not a whole lot of luck involved. Mr Jack is often praised as an excellent 2 player game but its one that I've never seen in stores and even online its hard to track down in Australia. I'm a bit late to the party on this one, but I've only just seen that Mr Jack has revised 10th anniversary addition just released! That will mean more copies should be available everywhere and I'll soon finally be able to get my hands on it! Jane Austen's Matchmaker: Yep played this one a little more than I wanted to this week, but was nice to get a refresh on the game for this weeks review. Yes the theme won't excite many but its actually an OK game worth checking out if you know anyone who loves Jane Austen. Dead Of Winter: Introduced this to two new players - their first impression was 'this game is way too complicated'. 10 Minutes into the game 'this game is cool, we need to try it with..' Great success! Roll For The Galaxy - I've never actually played Race for the galaxy, but figured after everything I've heard about Roll that it was the better version of the game to get. Haven't been able to arrange anyone to play it with yet though!